Last edited by JeffH; 10-31-2018 at 04:34 PM. I had them reserve my cabin for next year before I left the Iron Horse. I hope I can get my '80G ready by then. I am already in for next year. Received an email with attached confirmation of my reservation. Requires one to read and agree to the terms and return. So yes i have a confirmed reservation. Like Scott I reserved the same room at check out. Last edited by madmax-im; 11-06-2018 at 06:30 AM. I got my e-mail confirmation from the Iron Horse too, I'm looking forward to it. 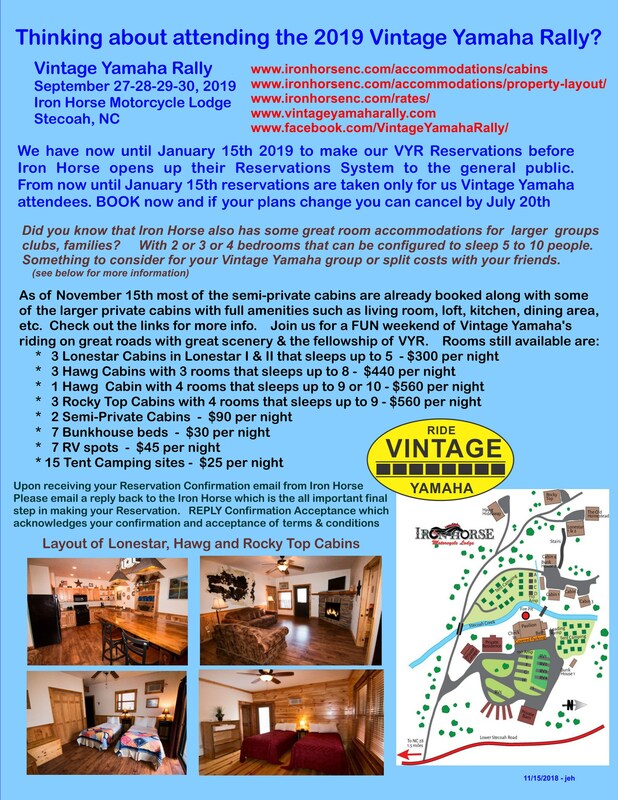 Already have your Vintage Yamaha Rally confirmation from the Iron Horse? "Please remind your VYR group members that we are still waiting on some of them to return their Confirmation Acceptances for reservations that they have made. This is a crucial final step in the reservation process. We realize that those of you who have been staying at IH for several years are not in the habit of doing so but it will help us out tremendously! We appreciate your faith in us but we are not robots and we do make an error from time to time." MaximPhil stated it correctly. They I-H, need a reply to confirm your receipt and your acceptance of the terms and conditions. Which is: can cancel before July 25th, on July 27th they will run your first nights deposit on your credit card and if you cancel between 60 and 30 days out there is a $20 charge. After that, a no show, last minute cancel or 30 days out cancel (without arranging someone else to take your room) and you will be charged for the weekend. So if you haven't replied with a Confirmation Acceptance email please do so. It helps Pam out and ensures you have the accommodation that you booked. Last edited by JeffH; 11-15-2018 at 07:08 AM. Will XS11 continue to anchor this thing? yes i have a confirmed reservation. Like Scott I reserved the same room at check out.